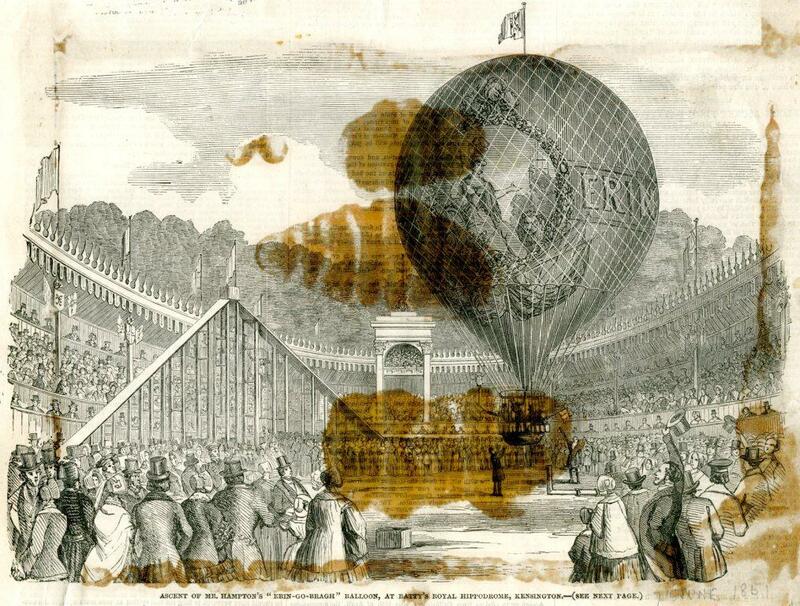 It’s a high summer at the moment so my mind is wandering back to a summer in another year, 1851. Was it a hot July in Kensington that year? Hot enough I expect, but not hot enough to deter a hypothetical young woman in her early 20s from looking for fun. We’ll call her Miss Charlotte Green, daughter of the widower Franklin Bryce Green, an American who had prospered in the wine trade whose British wife had died comparatively young, as wives sometimes did in those days of a disease which would be treated quite easily a hundred or so years later. (She was buried in the extensive and elegant grounds of Kensal Green cemetery near the mausoleums of the rich and famous). 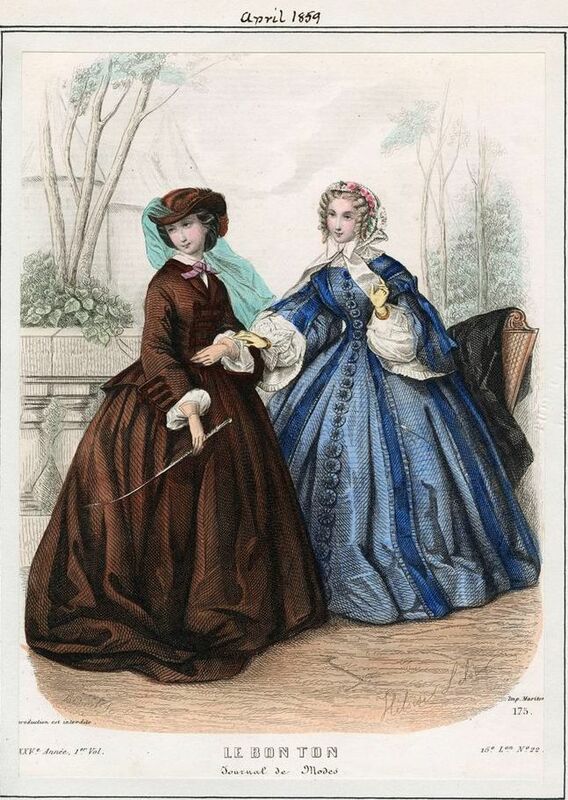 Charlotte had a governess/ companion always called Freeman by her father although her first name was Nancy. 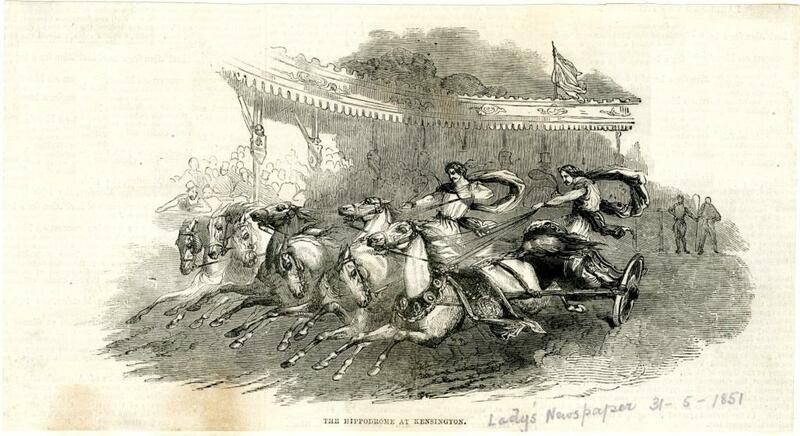 There was not much fun in Kensington in the 1850s . Barbara Denny and Carrie Starren, in their book Kensington Past actually have a section called “Not much fun” to illustrate this unpopular aspect of Kensington life. 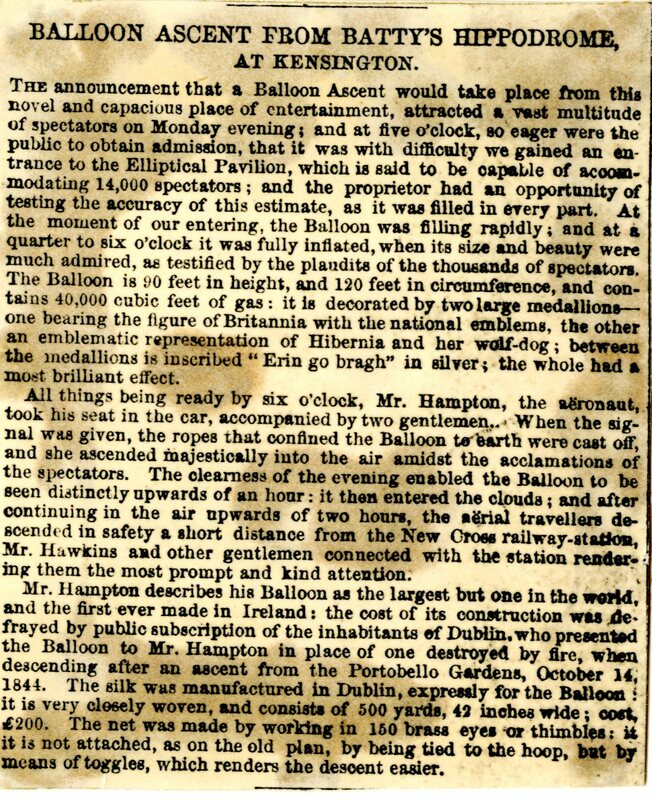 There was the Great Exhibition of course in the Crystal Palace in Hyde Park (May to October 1851). But Charlotte and Miss Freeman had been to that several times and although she enjoyed herself wandering around in the giant glass house, seeing and being seen, in the end it was just walking and looking. She wanted some excitement. Charlotte pasted pictures from newspapers and journals into a scrapbook. Many years later the images were faded and stained but they brought back memories of that summer. She was a regular reader of this publication. It featured news of a new venture launched by Mr William Batty. 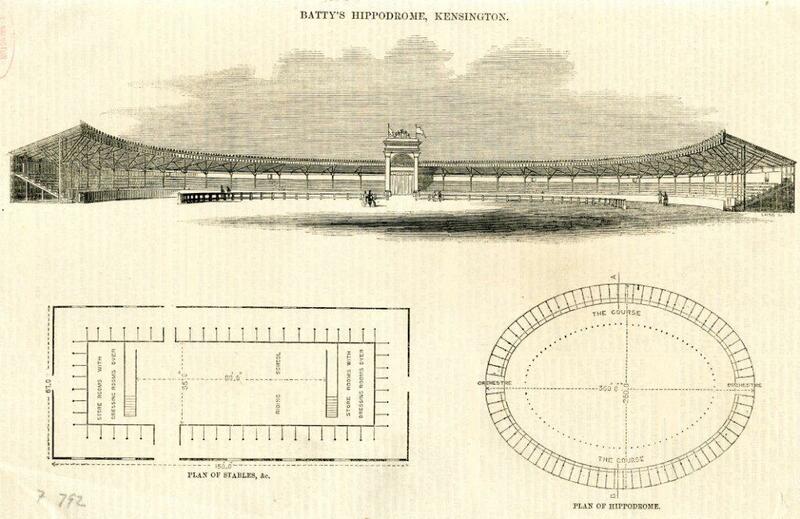 Batty’s National Hippodrome. Hoping to catch visitors to the Exhibition Batty had set up his arena on the south side of Kensington road near the road we now call Palace Gate. 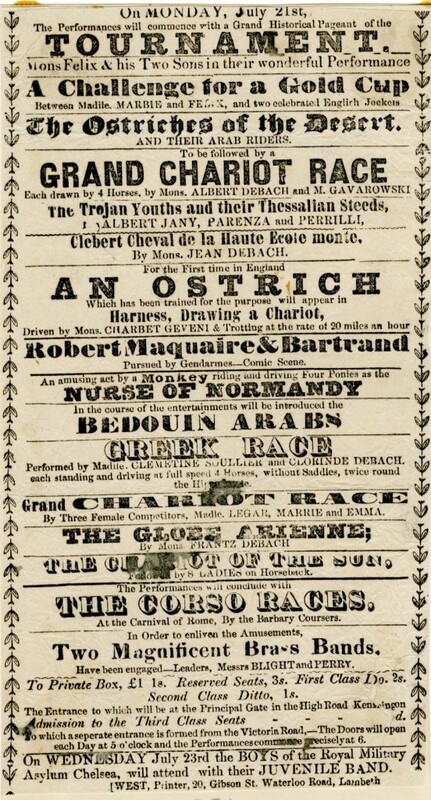 The handbills promised some marvelous equestrian and musical displays. All set in a splendid new arena, built to contain these wonders. 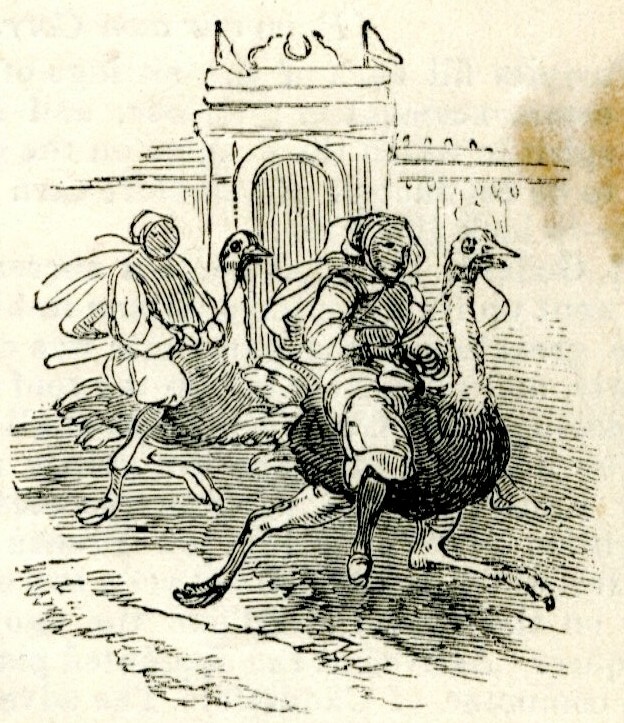 The Lady’s Newspaper published artist’s impressions of the races, including these two gentlemen recreating a chariot race between two Roman consuls. Charlotte like the idea of doing some fancy riding herself. She could do that, she was sure, and she had a decent riding habit. So they went, on Monday July 21st. 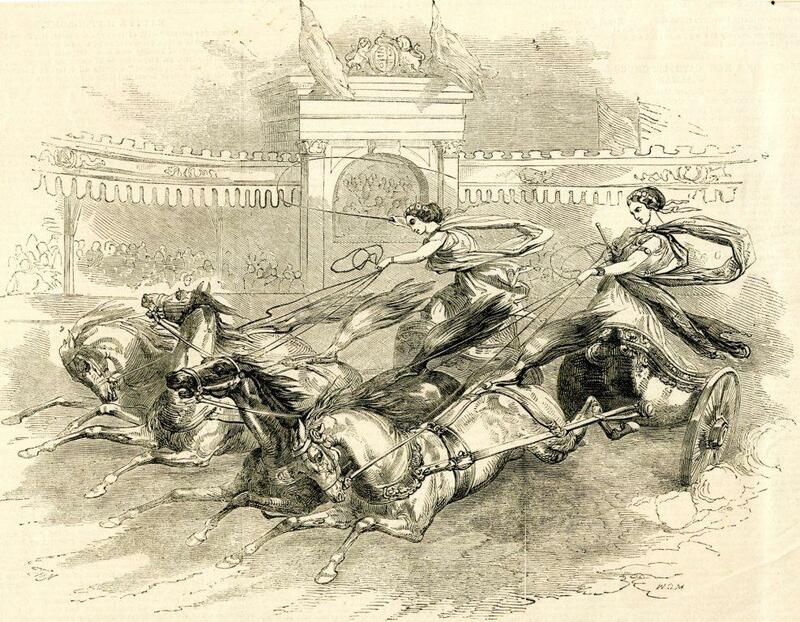 And they saw the “French equestriennes”, having their own chariot race. 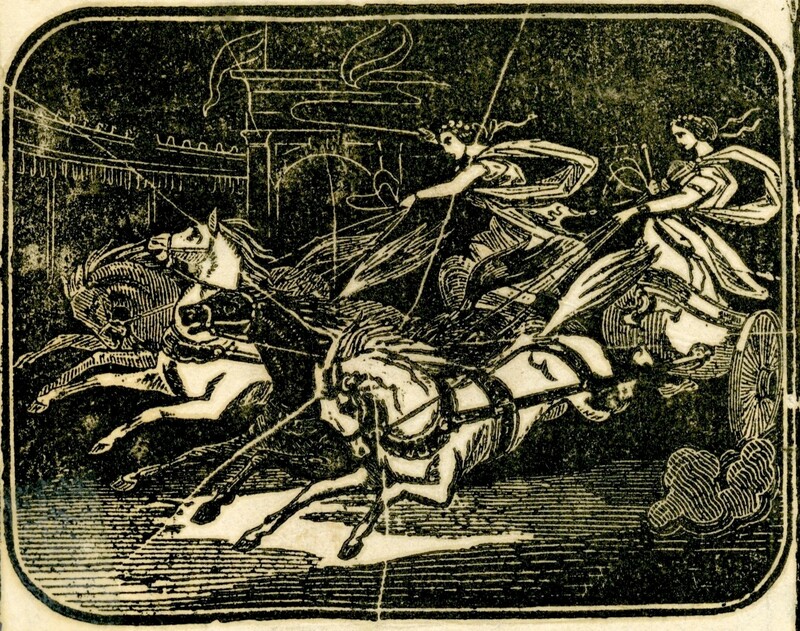 Charlotte could easily imagine herself at the reins of a chariot, outpacing the less adventurous Miss Freeman in the other vehicle. Well, they were good too, but Charlotte didn’t like the idea of riding one of those. She didn’t imagine the bird cared for it much either. Batty’s Hippodrome closed after one season but the arena stayed on the map for some years. 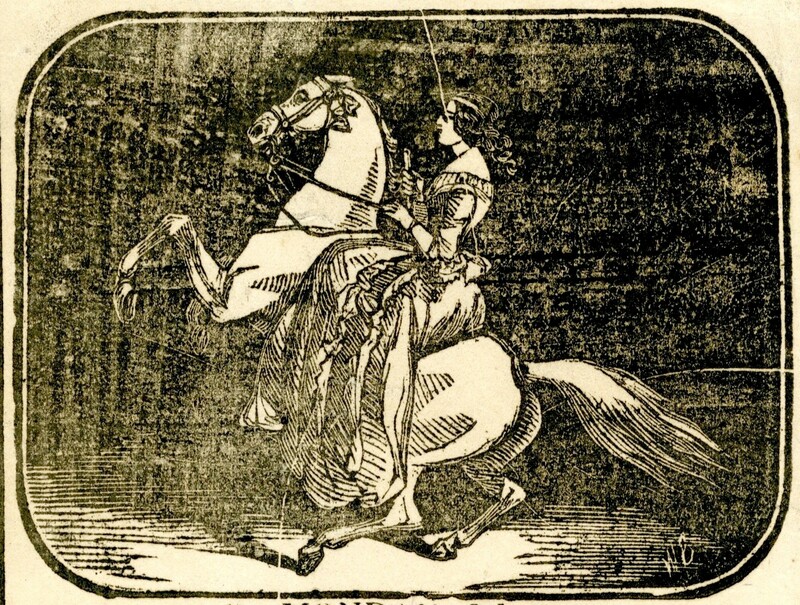 Charlotte took some proper riding lessons, but she still dreamed of equestrian stunts. I believe she inherited a considerable sum on the death of her father. Still unmarried, she and Miss Freeman travelled abroad, and who knows what feats of horsemanship they accomplished far away from Kensington? This was meant to be a quick throwaway post after the rigors of Kensington Church Street, but it’s a day late already. I’ve been a bit busy. 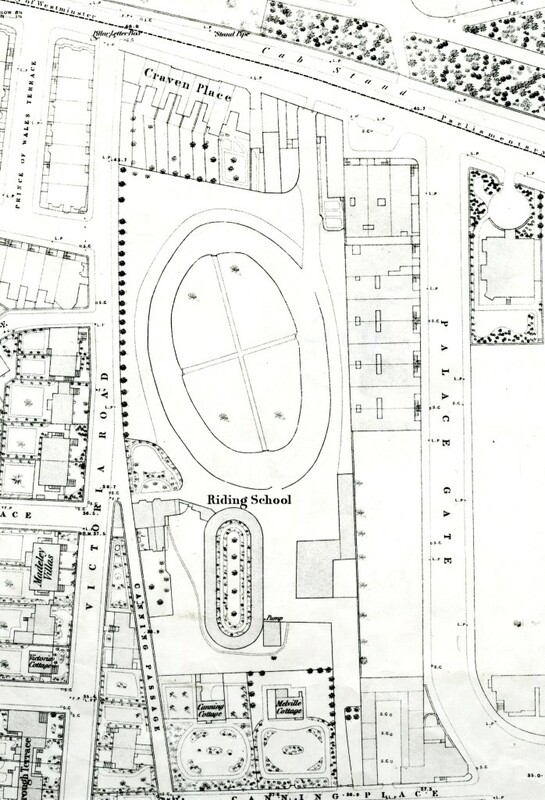 Many of you will have heard of North Kensington’s lost horse racing track, the Hippodrome. 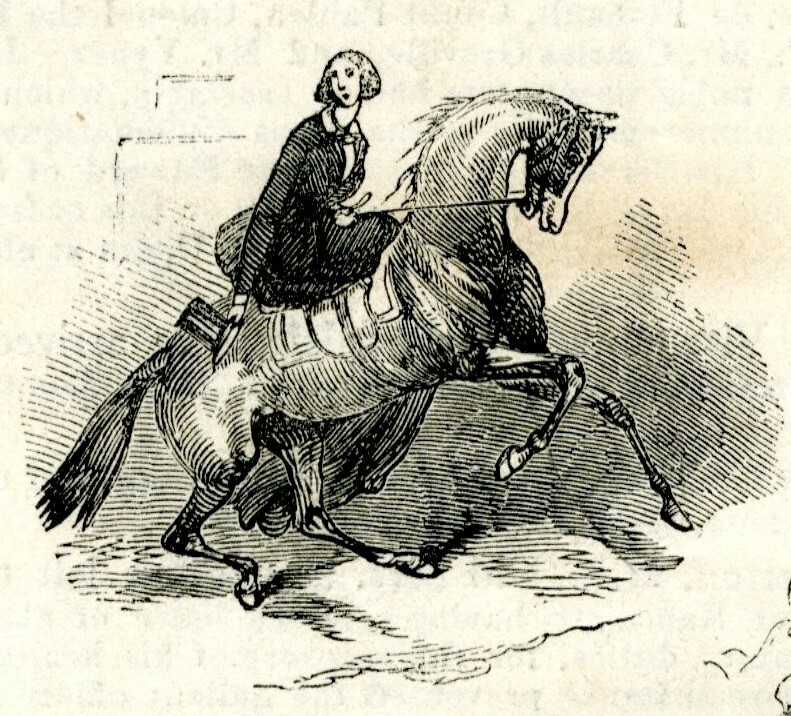 I did a short post on it for an internal publication back at the beginning of the blog called Horse Locomotion. I might revive that as one of this year’s Christmas posts. This week’s obituary notice is for the comic artist Steve Ditko, who collaborated with Stan Lee in the creation of some of Marvel’s best known characters, such as Spiderman and Doctor Strange. His quirky style could not be mistaken for any other artist in the years when Marvel had many of the greats. But looking back at the tributes online I realised that his post-Marvel work for DC and others was equally inventive. 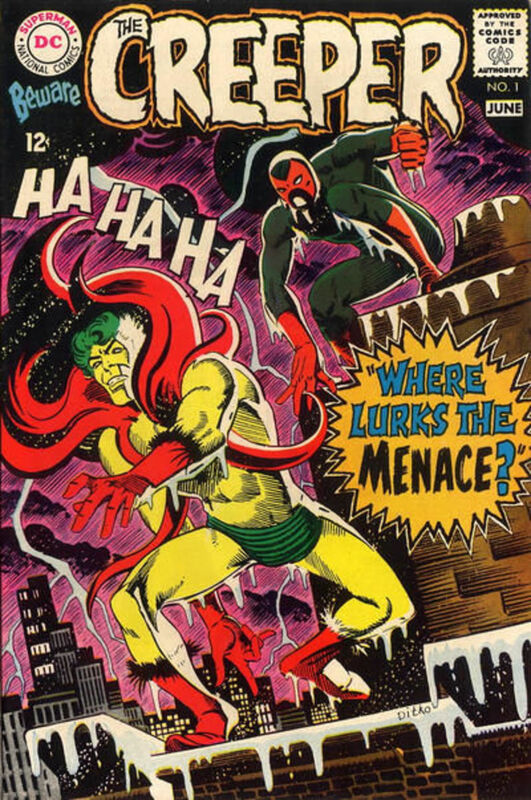 We may not remember the Blue Beetle, Nukla, Captain Atom, and the Creeper quite as well as the heroes of the Marvel universe, now being brought to cinema, but i did remember how many times I broke my vow of loyalty to Marvel by buying a DC comic featuring one of Ditko’s heroes. Thank you Mr Ditko. This entry was posted on Friday, July 13th, 2018 at 2:28 pm	and tagged with Batty's Hippodrome and posted in 19th Century, Kensington. You can follow any responses to this entry through the RSS 2.0 feed.